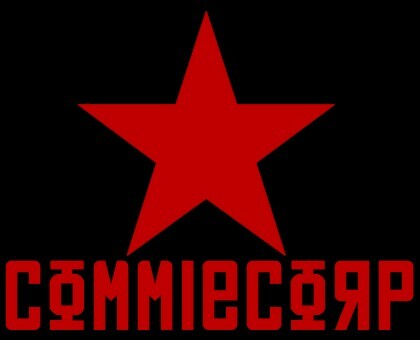 The Scarabian Commie Corporation was founded in 1917 by Josef S. Comit as a small foodstuffs company; through several hostile takeovers and severe negotiations, over the years they have acquired and branched out into industrial hovercrafts, paper, plastic and even space-grade material refining. Widely known for their unorthodox business practices, the company was embroiled in a recent scandal involving alleged Nimbusian slave trade operations; however, the whistleblower that claimed to have evidence of this died tragically in a craft accident, where he was accidentally mown down by a fleet of CommieCorp industrial loaders while walking towards the police station. 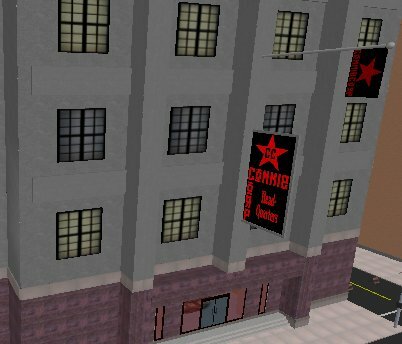 Since 1999, CommieCorp's President (who is also coincidentally the Governor of SW City's Central District), Samuel W. Comit, Jr., has led the company from strength to strength, managing to survive where other fledgling companies have failed. "CommieCorp loves you. Everything you will ever need, CommieCorp provides. CommieCorp owns your happiness." Holdings: Gas-In-A-Can Inc. | Paper Cut Industries | PlastiCo | TechStruction | CommieCorp Hovercrafts | CommieCorp Rations? CommieCorp has most of its holdings in the industry department, providing its business clients with processed materials such as plastics and metals. They're also a leading supplier of working class hovercrafts, such as the CommieCorp Grizzly, though they do offer a few budget, civil crafts. Unlike in the early days, CommieCorp has much competition in the commercial and industrial market with the growth of other giants such as SynCorp, MadCorp and Praxten?. However, due to their recent opening of a Duranium refinery, the company is seeking clearance to research and develop spacecraft.